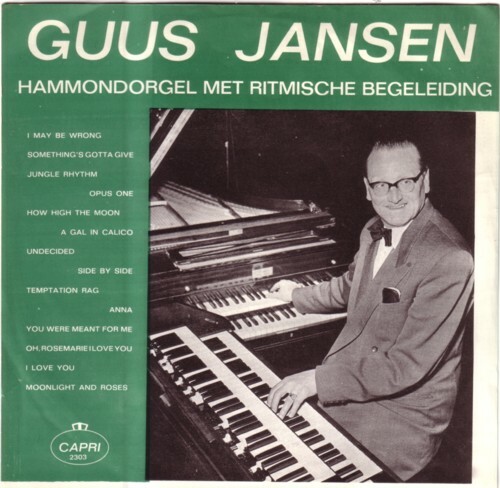 Guus Jansen is a Dutch organ player who started out his career accompanying silent movies in the Rembrandt Theater in Rotterdam, in the early thirties. Later he switched from the theatre organ to a Hammond organ and became a well known guest in radio shows. And of course he made some records. Mainly 78rpm records, but also at least two 10 inch LP’s. 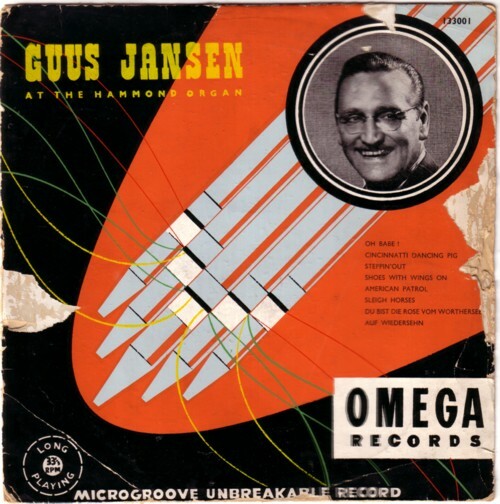 I don’t know much about Guus Jansen and I am not the right guy to judge his recordings. Most of the songs that I have heard seem to have been recorded to please an audience that needed music to read books by. But here and there I can hear that Guus Jansen was a jazz musician and that the music in his heart was wilder than what has been caught on record. Especially his own compositions show that, if he was born in a different place and time, he might have recorded more tunes like this, Jungle rhythm , which he composed and recorded in 1954. As far as I know, there has been no re-releases on CD of the recordings that Guus Jansen has made. And I doubt if they would sell. This Hammond organ music is as dead as the musicians who once played it. But I like to listen to music from an audio archaeological hearpoint. This is typically the kind of amusement music that doesn’t exist anymore. It is music for people who were going through bad times and wanted to forget their sorrows and troubles for a while and who had no television to make them forget, only music. I cannot name one contemporary musician that can play in the way that Guus Jansen did. It mainly has to with pretensions. I think that musicians had less of that in the past. And to much of it in he present.